You think it’s such a great idea to change up your Christmas theme, and then Christmas starts rolling around the corner and you realize you are not at all ready. I made these drop cloth Christmas stockings when I realized I didn’t have any this year that would match my theme. I pulled them together quickly and they barely cost me anything, so I thought it would be a good project to share. This is such a simple pattern, and anyone at any level sewing skill can pull it off. This is one of those projects where if I can do it, you can do it. My sewing skills are very *cough* lacking. As always, I like to bring you projects that don’t cost a fortune, but still look great. This is one of those, it fits all the fun parameters – quick, cheap and pretty! 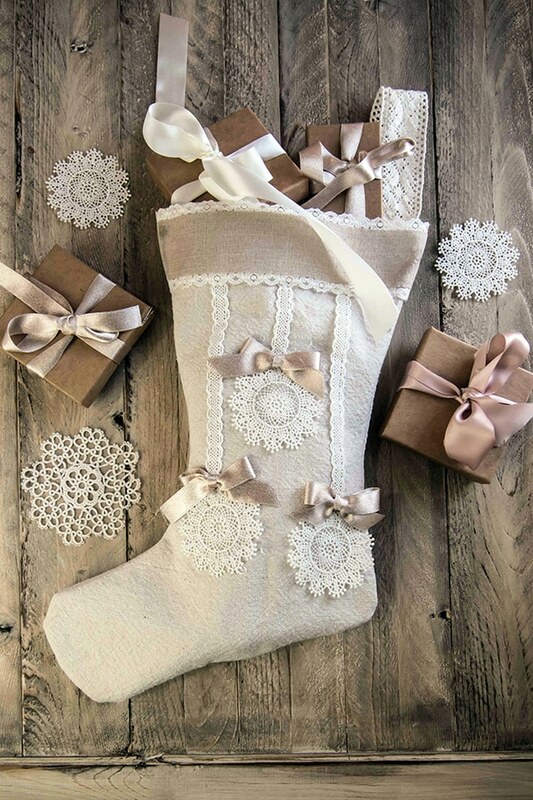 Drop cloth stockings, the perfect starting point for any Christmas theme and style.
. I love them, but they do come with a small downside. Drop cloths do unfortunately take a bit of preparation to get them ready for sewing projects. The canvas is stiff when you first pull it out of the package, very rough, and not all great for sewing. To get my canvas cloths soft I soak them in a 10-gallon stock pot with 3 cups of vinegar and boiling water. I let the water boil first, then toss my drop cloth in and turn off the heat and let it soak overnight. If you do not have a large stock pot, you can wash your drop cloth 2-3 times in the washing machine on hot to get the same effect. After each cycle, test the drop cloth by feel to see if it is soft and pliable. In the morning I toss the drop cloth in the washer and tumble dry. Easy peasy! This process does a good job of removing the stiffening agent that is applied to the canvas. Drop Cloth Colours and what to do if your drop cloth is a bit yellow. I toss a full cup into my washing machine when it’s time to wash. This does a decent job of removing any yellowing or discoloration if it is needed. It’s a bit hit or miss with the colour of the drop cloths, sometimes they are an off-white, sometimes and off yellow, and once in a while they have a bit of a blue tinge. If you want your drop cloths super white – add bleach instead of vinegar to your overnight soak. Notice I said “instead”, that’s because you do not want to add bleach to vinegar soak, that’s just bad news, don’t do it. Replace your 3 cups of vinegar with 2 cups of bleach, and that should do the trick. Don’t worry about the bleach. The canvas is heavy duty and durable and can handle an overnight bleach soak. And if you want colour, the cotton drop cloth fabric is very easy to dye, so you could colour them to your heart’s content. Lay your fabric flat. I find it easier to split my drop cloth in half so I can work with smaller pieces of fabric. Make sure it’s nice and flat, no wrinkles or puckers. You may need to run a hot clothes iron over the fabric to get it to lay flat. Pin your pattern down to make it easier to cut. Once you have your pattern cut out, zip it through your sewing machine with a 1/4 inch seam allowance. I added a 1/2 inch hem on the top, and that was that. It only took about 30 minutes to cut and sew five of these drop cloth Christmas stockings. It was really that quick and that simple. I decided to make five different stockings to show you how easy it is to change the style. 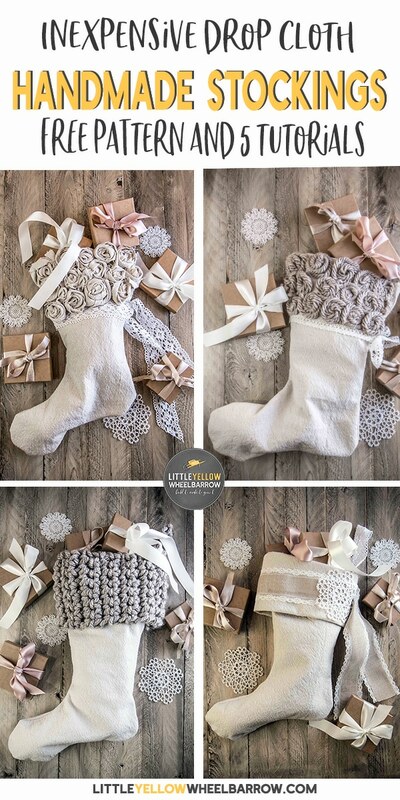 A bit of ribbon here, an applique there, a little bit of crochet, and a lot of glue from a glue gun is all it took to make these farmhouse style Christmas stockings. You can do anything you like with these, that’s the great thing. Since the cost is so low, and time to cut and sew one is so quick, you could make a stack of these in no time flat. It would be a fun project to do with a group of kids too. Create a stack of inexpensive basic stockings and have the kids decorate them any way they want. Super fun Christmas time activity that won’t break the bank. #1. 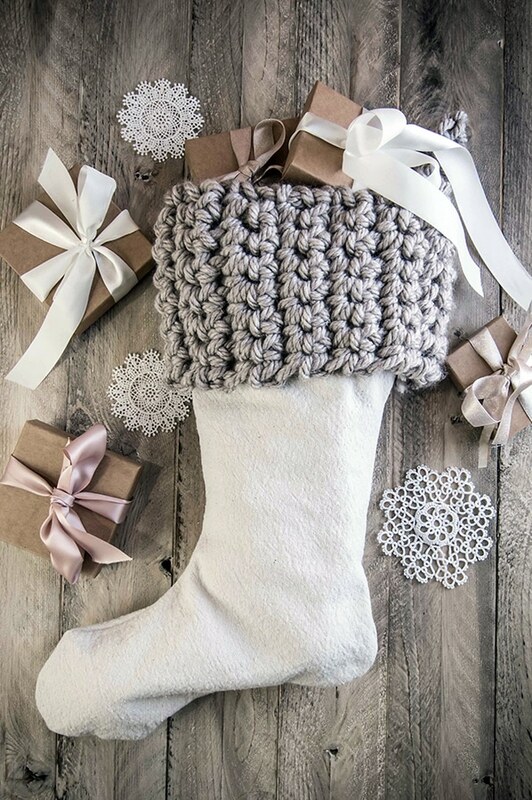 An easy crochet Christmas stocking – well not really, but close enough. So it’s not really a crochet stocking, but it does have a crochet cuff. This crochet cuff is SUPER easy folks, even if crochet isn’t your specialty, if you can single crochet, you can make this cuff. Single crochet 16 rows, and test to see if the cuff will fit around the rim of your drop cloth stocking. 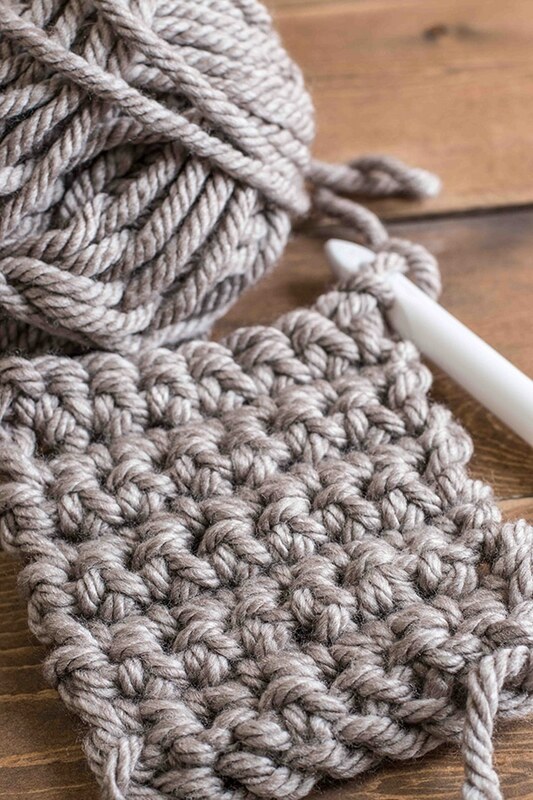 I would love to say that 16 rows are exactly what you need to crochet, but we all have different tensions when we’re knitting and crocheting, so it’s best to manually measure. Once your cuff fits comfortably around the top rim of your drop cloth stocking you can bind the sides together. Single crochet your last stitch from your last row, into the first stitch of the last row. Match up your side, and single crochet the two sides together all the way to the top. This is your seam, and don’t worry, you won’t see it because you can turn it inside out. Once you get to the top of your two sides, you will continue on by chaining 12 more times. 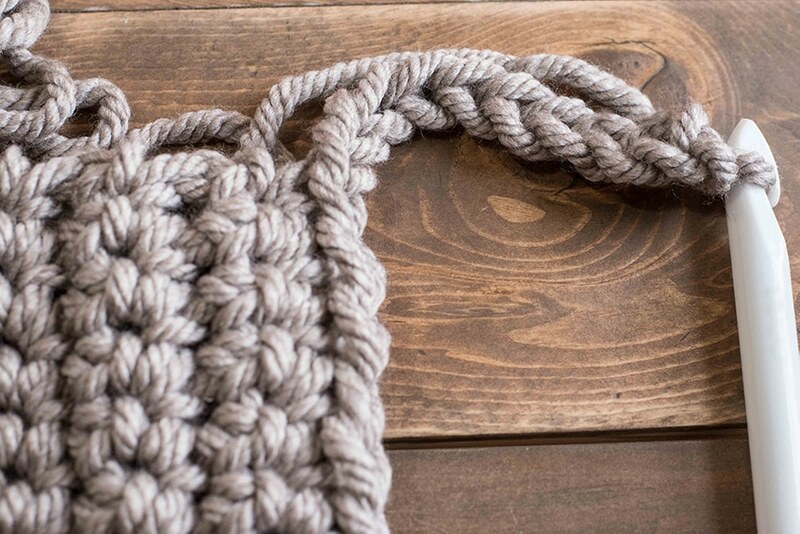 Single crochet your chain back into the top of the crochet cuff to create your stocking hanger. Tie off your end, and weave it in. The cuff will slip over the top of your stocking and you can now use a needle and thread to tack the cuff to the stocking. It doesn’t take a lot of work and goes quite quick. I didn’t get fussy, I just wanted to make sure that the stocking could take some weight without the cuff coming apart. #2. 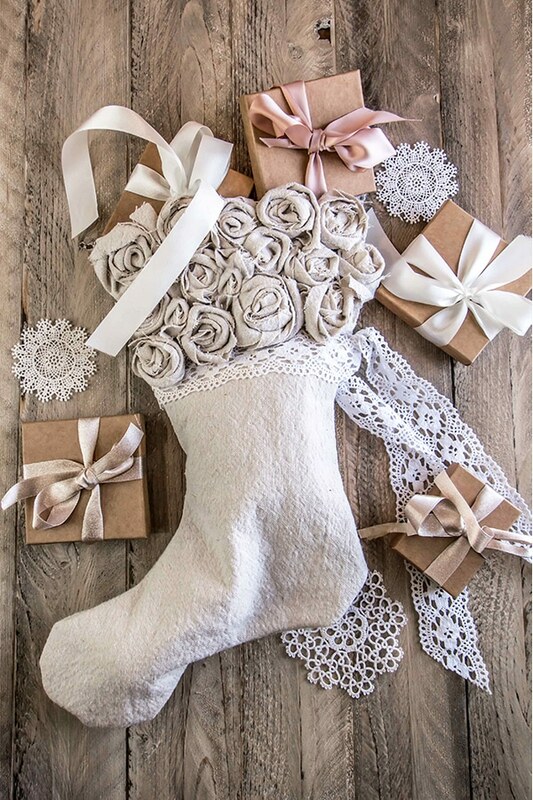 A rustic rose covered stocking – a little farmhouse and little vintage. Of the five stockings, this one was my favorite, but I love all things roses. Husband, if you’re reading this – hint hint. Last spring I made a rose covered pillow with a similar method, and it ended up being a pretty popular post. 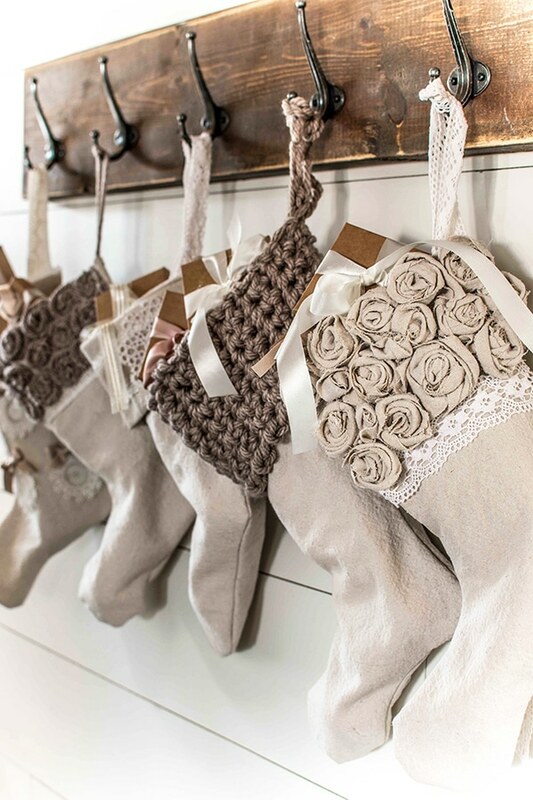 People really liked those drop cloth roses, so I thought why not on a stocking? The method for making the roses is easy and doesn’t take a lot of time. You could sew your roses on to your stocking, but I just used a glue gun to attach the roses to my stocking. 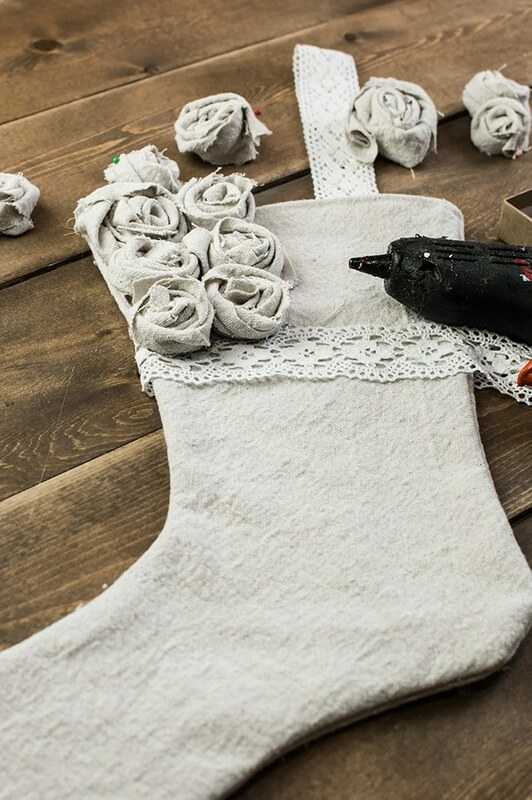 Use any scrap fabric that you have left over after making your drop cloth stockings. You want lengths about 16 inches and 3-5 inches in width. Make them all different sizes so you have some variation to your roses. 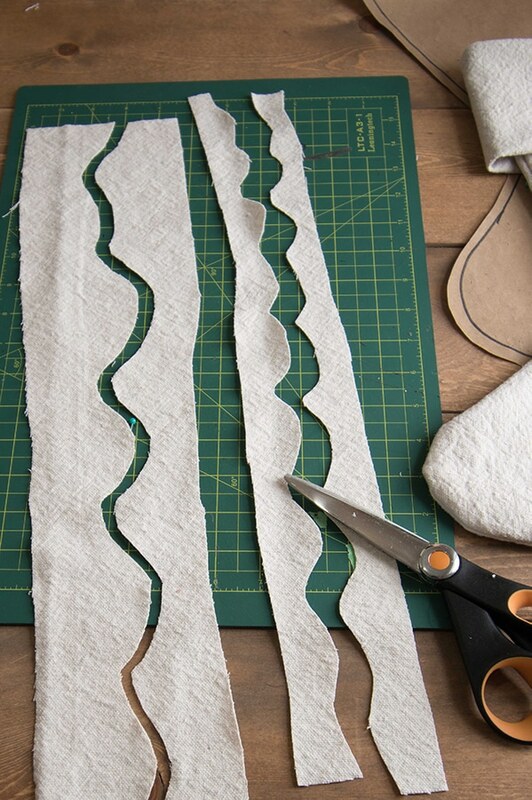 Cut curved lines through the center of your strips of fabric as shown in the photo below. Once you have your roses finished, start gluing them on one by one. Make sure there are no gaps and try to get as close to the edge as you can. I added a bit of lace trim because I felt it need a little something more, and hand sewed a hanger to the corner. This one is easy; actually, it doesn’t get any easier! 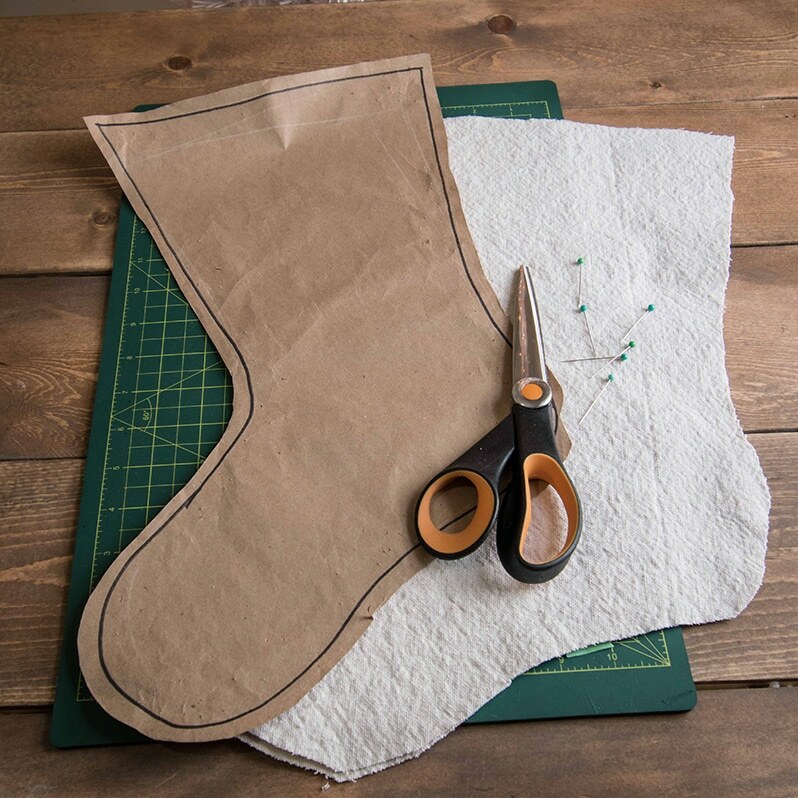 This stocking only requires a hot glue gun, some leftover yarn, and maybe a small piece of ribbon or lace trim. Add a circular blob of hot glue, and give it a few seconds to cool down a bit. Start your yarn in the center of the glue and wrap outward, creating a spiral, or circular pattern. Stagger your circles, so that the second row nestles in-between the two-row circles as shown in the photo below. Keep adding glue, circles for 4 full rows. Add a hanger. 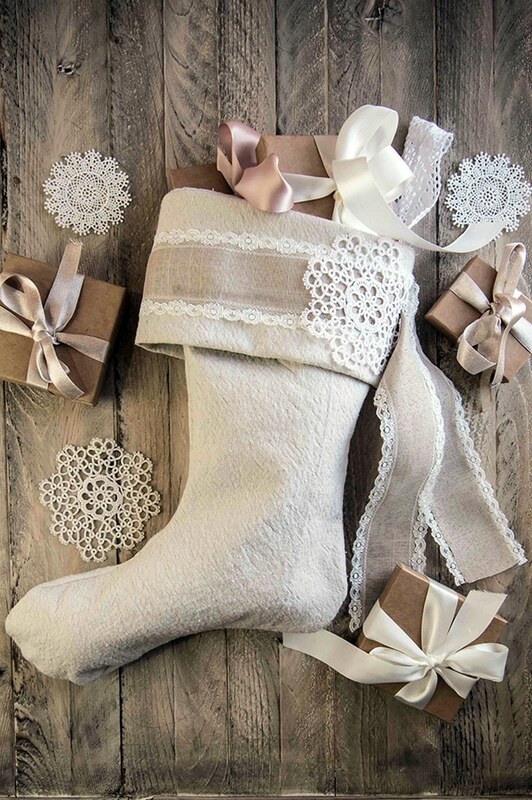 I used a small scrap piece of lace and hand-sewed it to the corner of the stocking. 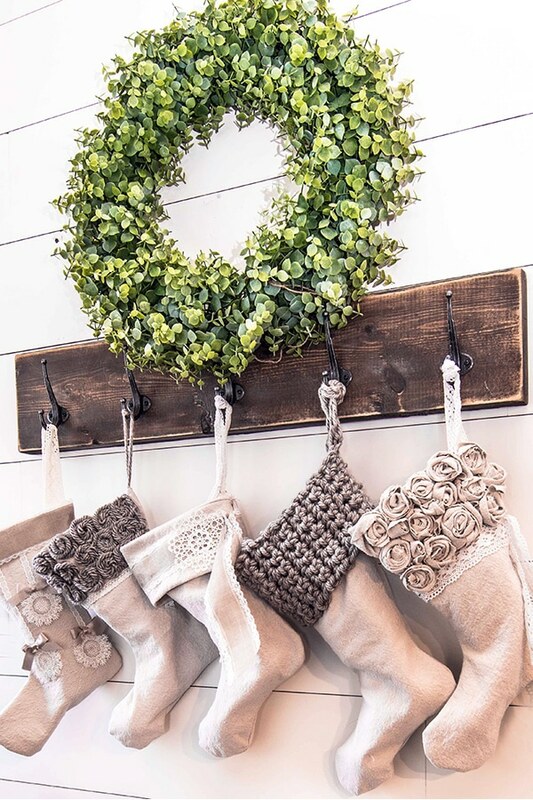 This is a super simple way to decorate a stocking. You could get very creative with this method and make trees, or words, or anything really. This stocking was the easiest (no this time I mean it). A bit of ribbon trim, a small snowflake applique, and a lace hanger. I did make a cuff for the top of the stocking to add a bit more texture. 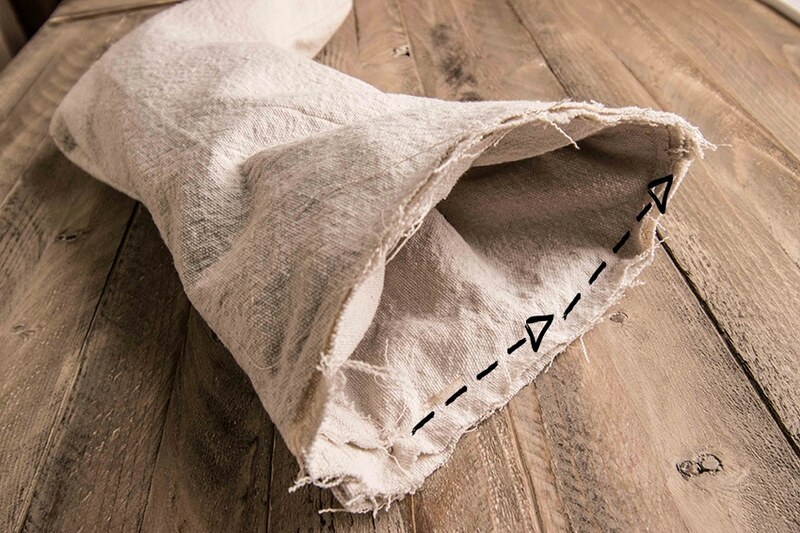 Cut a piece of fabric from your drop cloth that measures 18.5 x 9 inches. 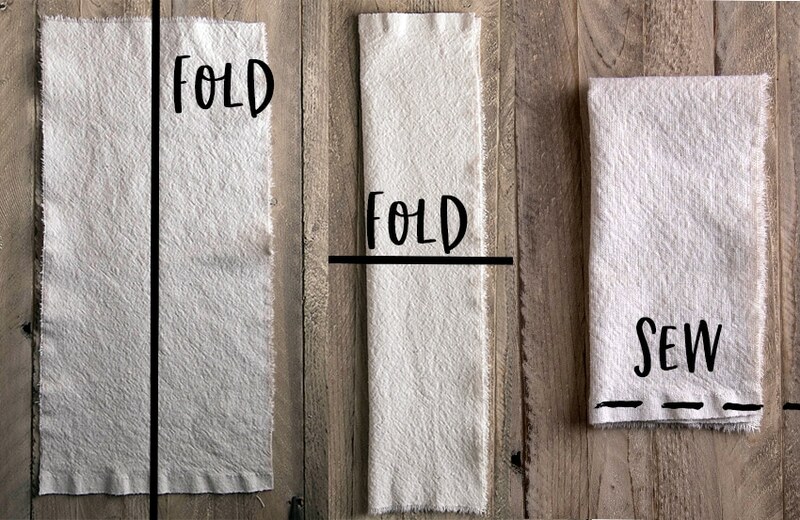 You will fold it twice as shown in the photo below and sew along the bottom. Tuck your cuff into your stocking, all raw edges will be lined up, as in the photo below. Sew a 1/4 seam along the rim. Flip the cuff out by turning it right side out. Add a piece of wide ribbon across the cuff, a small applique or small ornament to add some additional texture. Sew your hanger to the corner with a needle and thread. #5. Hanging ornament with bows and ribbons. Not going to lie to you, this blog post was supposed to be only FOUR Christmas stocking ideas, but when I started to take the photographs, four just wasn’t cutting it. They do say that when decorating group things in odd numbers. I have found this to be true, so no idea why I stopped at four. I needed a 5th stocking, so I went upstairs, cut and sewed another stocking, and had it decorated before my husband had our morning coffee made. He was impressed (don’t tell him but so was I) because the first four took some fiddling and playing around but this one came together in under 10 minutes. Add three round appliques (mine were snowflakes) to your stocking to make them look like staggered hanging ball ornaments. If you don’t have appliques no worries! Cut circles out of scrap drop cloth and use some fabric paint (or any paint for that matter), and use them in the same way you would the appliques. 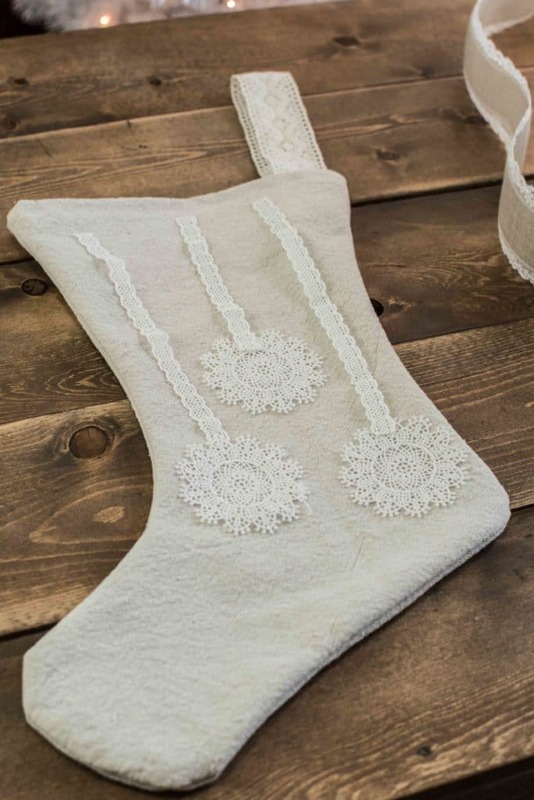 Cut ribbon, or lace long enough to go from the top of the applique or ornament to the top of the stocking. Use hot glue, fabric glue, or hand-sew your appliques and ribbon or lace in place. Add a ribbon cuff across the top, and a hanger in the corner. 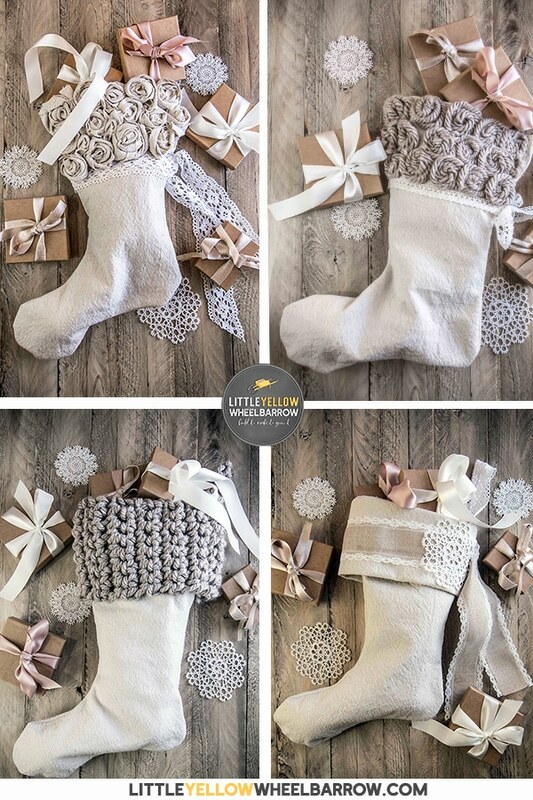 Pulling it all together – new Christmas stockings to match a holiday theme.
. 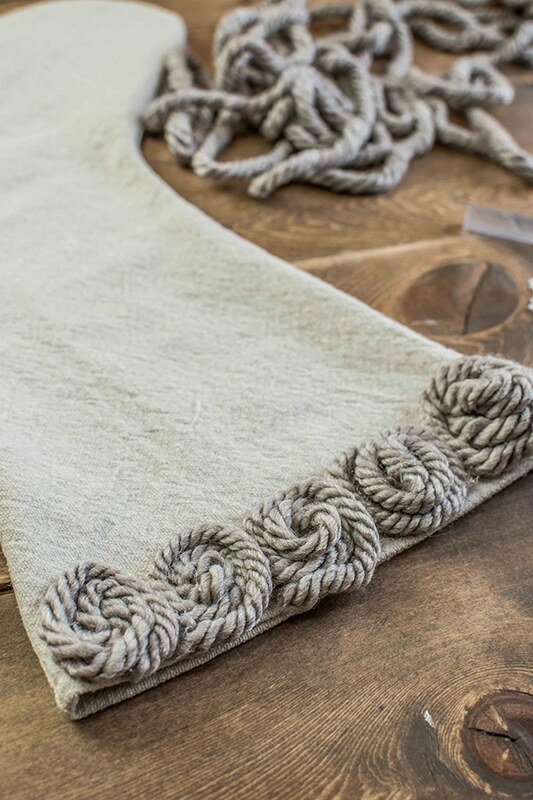 They make for a very inexpensive fabric that is perfect for rustic, farmhouse, vintage feel projects. Also, if you have any leftover fabric, you could make a whole host of Christmas decorations, or even home decor. A few suggestions for this holiday season – you could make pillow covers and decorate them to match your stockings, or even a table runner, or tree skirt. I’ve even seen fabric magnolia wreaths made with drop cloths, OH and … don’t forget good old fashioned rag wreaths. You could whip up a whole new holiday theme with a drop cloth or two! Thank you so much for all your wonderful, inspiring, just my style ideas!! I love drop cloths too and use flowers in my garden to natural dye them. It takes the dye great. thanks again, I’m so happy I found you! Such a lovely comment to leave Kim, thanks so much! I never even considered using flowers to dye my drop cloths but now I think I will add that to my summer projects. What a great idea! These are some of the cutest stockings I’ve seen. Love them!! Great job! Thanks, Debra! So nice of you to take the time to leave a comment, it means so much. Cheers! Ohh! 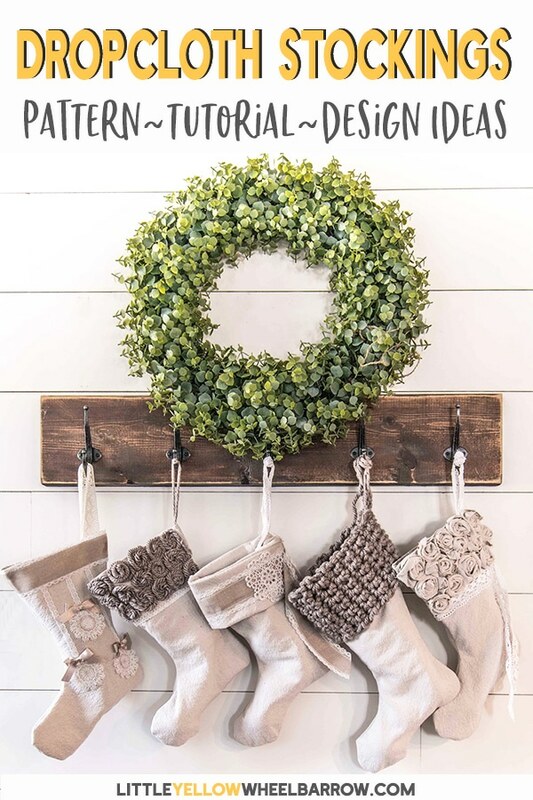 These are just as cute as can be and I love all of the different ways you decorated them! The rosette one is my absolute fave! Super Impressive. When do you open your etsy show!? Lol, never! I only ever have the patience to do something once and the attention span for a single project at a time. 😉 Thanks for the comment Koko! 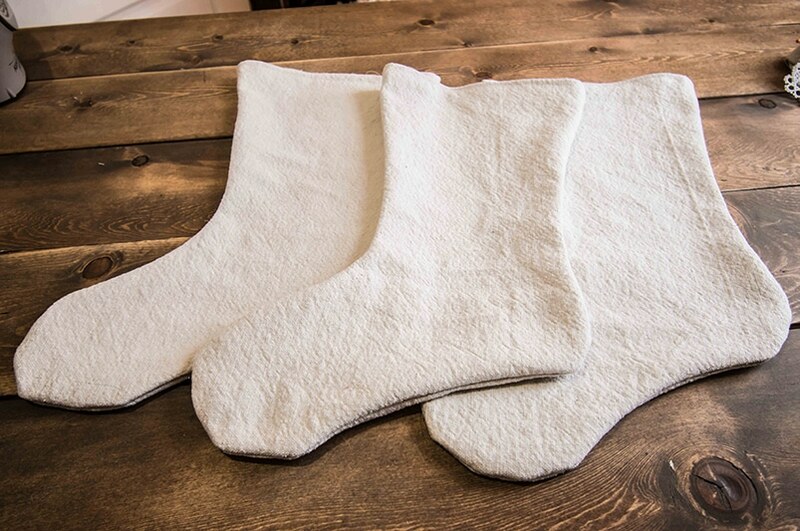 These are GORGEOUS and I am so happy that you shared your tip on softening drop cloths. I had NO IDEA that was a thing. Pinning this to several boards, thanks! These are stunning stockings. Pinning these Sinai can give them a try. I agree with Julie! These are going to be a hit. They are so on-trend and just beautiful. I can tell you put a lot of work into this post, and your instructions are perfect. I’m inspired to make some of these for our home or even to give away as gifts! Bravo! Aww, thanks, Julie! You always say the sweetest things. Thanks for the pins!